Ho usato un mix di Distress Inks per sfumarlo nei toni del rosa e dell'arancio. Sulla parte frontale, in basso, ho incollato la scritta "Just to say...". In alto invece ho aggiunto un fiore fatto con la fustella Striped Nasturtium (Sue Wilson) e una foglia "stitched". La foglia e il sentiment erano in regalo con una rivista. Anche questi abbellimenti sono stati ricavati da piccolissimi avanzi di cartoncino. Poi ho incollato tutto sull'altro pezzo di cartoncino, che avevo in precedenza perforato su un bordo con un punch brand Artemio e piegato a metà. 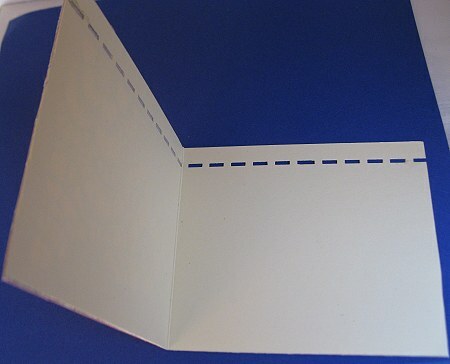 In questo modo la card ha all'interno un dettaglio che non è visibile sulla parte frontale, ma solo all'interno e sul retro. Love , love , love these pretty colours and that really is a super die cut/punch. Glad you found a card you had not shown yet. Hugs Mrs A.
Fabulous as usual. Yes, the colors are so retro and funky and the negative idea is great. Thanks for sharing with us at Unstampabelles. What a sweet little card! Fabulous blending of the distress ink, the colours go so beautifully together. Lovely flower too. Beautiful card,Alice.Love the pretty flower and the sentiment. 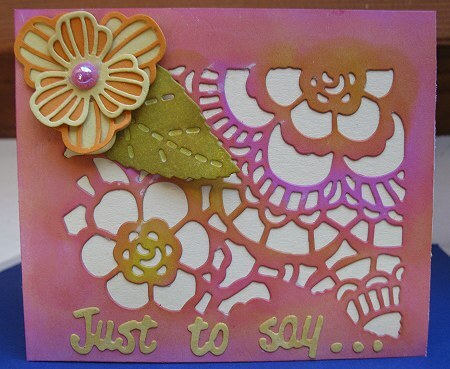 ooo, this is stunning creation - great design and such lovely colours and dies. Such a pretty card, lovely colours and fabulous die cut details. Very pretty. Thank you for sharing with us at Unstampabelles. Wow Alice, this is beautiful! It may be simple to you, but I think it's gorgeous and wonderfully detailed! The main die cut image is so lovely and I think the white background really works to make the soft colours pop! Your flower is fabulous. The filigree petals and all the layers, love it!! What a sweet way to say just because to someone, a treasure to keep for sure!! Love the die cut background! A for you simplish design, I find it really elegant and feminine. A winner!